The US Patent & Trademark Office is updating its systems, claiming that the update will streamline the user’s experience for filing, prosecuting and maintaining patents. You can learn more and sign up to virtually or physically attend their information session (to be held on 5 November 2015, 2-4 Eastern time) here. 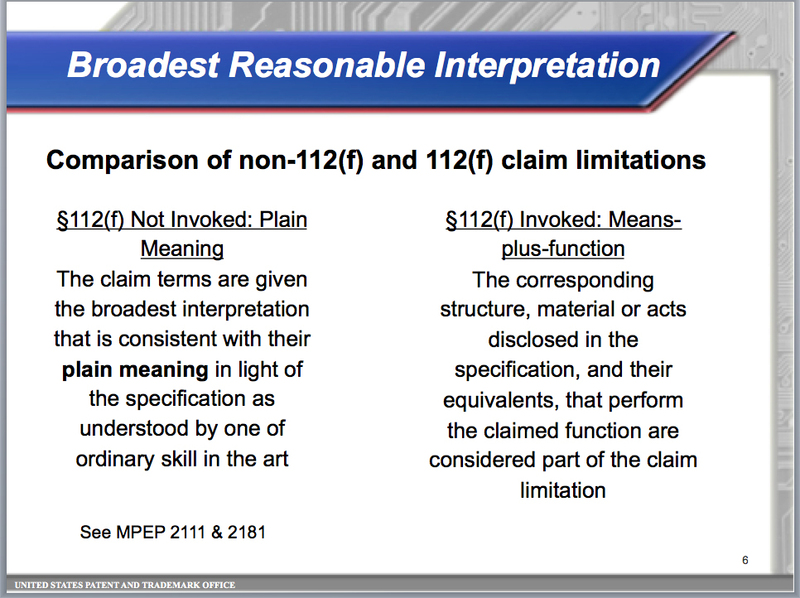 Against that backdrop, we have MPEP 2111.01, which tells us that “Under a broadest reasonable interpretation, words of the claim must be given their plain meaning, unless such meaning is inconsistent with the specification. The plain meaning of a term means the ordinary and customary meaning given to the term by those of ordinary skill in the art at the time of the invention. The ordinary and customary meaning of a term may be evidenced by a variety of sources, including the words of the claims themselves, the specification, drawings, and prior art. However, the best source for determining the meaning of a claim term is the specification – the greatest clarity is obtained when the specification serves as a glossary for the claim terms. The presumption that a term is given its ordinary and customary meaning may be rebutted by the applicant by clearly setting forth a different definition of the term in the specification.” Thus, the plain meaning of any term may be redefined by the patentee within the four corners of the patent application, and the examiner must interpret the term as that term is interpreted by the patentee. Including a glossary in your application is good practice that patent applicants often fail to do. By including a glossary in your application as part of the specification, you become your own lexicographer and define terms, even terms whose plain meaning is otherwise clear, in the way in which you want those terms to be interpreted by the USPTO and by the courts. The plain-meaning vs. means-plus-function claim interpretation is only one of the reasons why you don’t want to write a patent application yourself. On September 16, 2012, the America Invents Act is slated to change who is entitled to the title of “applicant” in U.S. national patent applications, removing the requirement that inventors be named as applicants solely for the purposes of US designation. This impacts applicants who have filed under the Patent Cooperation Treaty (PCT) and brings the US patent system further into alignment with those of the rest of the PCT signatory nations. I can’t do a better job of dissecting this complex new patent legislation, the first overhaul of the patent code since the early 1950s, than does Professor Jeff Hawley, who teaches at my alma mater, the former Franklin Pierce Law Center (now University of New Hampshire School of Law). His video and presentation slides are definitely worth a look. Star Trek influences many aspects of our society; flip phones, for example, came from Captain Kirk’s flippy communicator. Now, it seems, the Romulans are getting in on the 21st Century act. A Swedish company, BAE Systems, has conjured up a cloaking device. See Bae Systems’ cloaking device. I love it when sci fi isn’t so fi anymore. Factoid: The USPTO has issued millions of patents. Number 8,000,000 will issue in 2011. The USA is a very, very inventive country. At 8,000,000 patents in just under 200 years, we’ve come a long way since the verdict was issued that “everything that can be invented has already been invented.” We’ll keep on inventing … and inventing … and inventing. That’s how progress is made. Now isn’t this interesting. China, whose ancient and noble culture does not include much respect for intellectual property, believes that it will be the leader in the world for issuing patents in 2011, outgunning the USPTO, the European Patent Office, and Japan. They say that both number and quality of patents have increased steadily to the point where the Chinese Patent Office will issue the greatest number of patents in 2011. I never knew it was a race. Patents are good within the geographic boundaries of the sovereign nation that issues the patent during the term of the patent. Therefore, patent offices don’t compete with each other the same way that, say, a car dealership competes with the dealership down the road. You can — and often should — obtain patent protection in more than one country. China cannot grant patent protection in the United States or in Japan or in the European Union or in any other country; the patents issuing in China may well also issue in other countries. Other patent offices might consider hunkering down and getting ready for a blitz of applications based on the number of Chinese patents whose owners may seek foreign protection. I am delighted, however, to see that China’s Patent Office is so very busy. That says to me that Chinese law recognizes the intellectual property rights of others; the culture, then, should follow suit, though perhaps the culture will move more slowly than does the law in this instance. The fact that they are signatory to the Patent Cooperation Treaty (they entered the treaty on 1 January 1994) says that the laws governing this culture are changing, which will eventually change the culture’s respect for intellectual property. It hasn’t even been added to the list on the internet as of this writing, but Chile has deposited its instrument of accession to the Patent Cooperation Treaty (PCT) with the World Intellectual Property Organization (WIPO), the administrator of the PCT, and will become the 140th PCT Contracting State. The PCT will enter into force in Chile on June 2, 2009. Welcome, Chile, to the Wonderful World of the PCT! The map, btw, is from GOOGLE Maps. Chile is that long, narrow strip of a country along the western shore of South America. Just west of Argentina. Argentina, btw, is currently in the process of signing the PCT, but has not yet deposited its instrument of accession with WIPO. “The United States Patent and Trademark Office (USPTO) is seeking nominations for the nation’s highest honor for technological achievement. The USPTO administers the NMTI program on behalf of the Secretary of Commerce. The deadline for nominations is May 29, 2009. Nominate yourself if you want. Or nominate the inventor in the next lab. Or, if she’s an inventor, nominate your next-door neighbor. It’s quite an honor for an inventor to receive this medal. The contribution for which the medal is given DOES need to be something that really helps out in the art in which the invention lies. Examples of prior winners include Steve Jobs; Steve Wozniak; IBM; Industrial Light & Magic; Ralph Baer (the guy who basically invented video gaming); eBay; and others of like contributory scale. The President of the US awards the medal every year.